This is a great new blog! Worth looking at! I love it when designers and homeowners find a way to do things a little bit differently. The change doesn’t have to be dramatic. Sometimes it’s simply a fresh take on something we’ve seen before. I hope you enjoy these great ideas as much as I do. Who knows? Maybe they’ll inspire you to think of a clever design idea of your own! 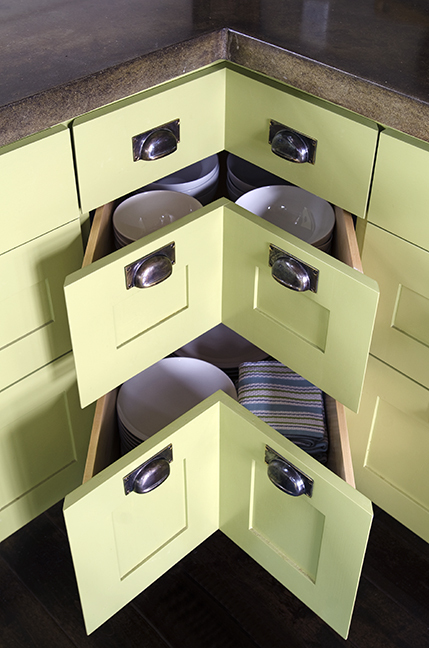 To pack in storage space and keep the pretty visual of drawer fronts, designer Kristina Crestin came up with these awesome corner drawers. 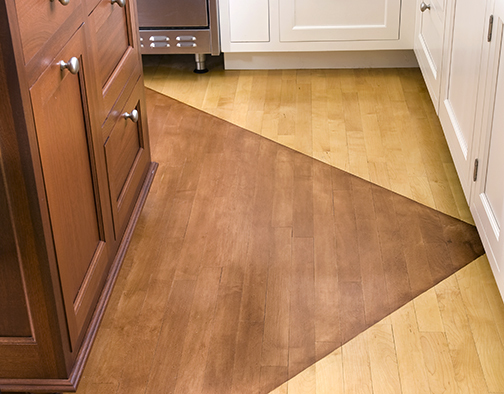 Who said you need to stick with a plain wood floor? Designer Jody Thaxton added a fresh twist by using two different stains and a bold triangle pattern. We’ve all seen inset shower niches – many of us even have them! But did we think to jazz it up with a pretty mix of tile?